Since the news came of Anisha KC\'s death in a bomb blast in Tripureswor on 2 September, her mother, Sangita KC, has not been able to get out of bed. 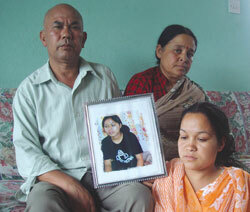 Her father, Krishna Bahadur KC, was so shattered by the news that he could not even go to perform Anisha\'s last rites. Her 67-year-old grandfather, Lila Bahadur, had to organise the funeral and other other ceremonies at their house in Naikap. Sangita kept asking us: "What did my daughter do that she was taken from us so cruelly?" Anisha, just 18 years old, was on her way home from Biswo Niketan Science Campus, waiting for the bus, when the bombs exploded and she died on the spot. Friends and teachers remember her as hard-working and extremely smart. She topped her class every year and was committed to becoming a doctor, which is why she joined the science faculty as soon as she had finished SLC. She would spend her free time playing computer games and liked to help her parents around the house. Sandhya Khadka was waiting with Anisha at the bus stop for a bus to Thankot. When the bomb exploded, Sandhya was severely injured. She was rushed to Bir Hospital, where she fought for her life for 53 hours before succumbing to her wounds. Like Anisha, Sandhya's family (pictured) is also devastated. Her father, Narendra Kumar Khadka, 56, and mother, Pushpa Khadka, 48, have still not been able to deal with the fact that their daughter is no more and that she will no longer walk in, dressed in school uniform, like she did when she was alive. "Whoever killed our daughter may live a thousand years, but may they feel like death every moment they live," says Pushpa, looking at Sandhya's picture. According to Puspha, her daughter wanted to be a nurse, was happiest while working with elderly people and shunned discrimination of any kind. Like Anisha she was extremely hard-working. "She would study till the small hours, then wake up early to perform puja every morning," says Sandhya's father, Narendra. "In fact she was up till late the night before she died, preparing for a class presentation." Her parents tried their best to save their daughter. They bought expensive medicine when Sandhya was in surgery, and her uncle donated his blood because it matched her blood type. Sandhya's injuries were only from the waist down, but quite severe. "All our efforts failed," says Pushpa. The same evening, Pancha Bahadur Shahi was near the micro-bus that exploded in Balaju. The area where the incident took place was crowded, and Shahi knew he could not face the sight of blood so he decided to go home. Little did he know that his beloved wife, Kamala Devi Shahi, 56, was one of the victims. The couple had been shopping in the afternoon for their grandson's rice feeding ceremony. They bought two tickets for Ram Dev's yoga session and Kamala sent her husband home. When she did not come home in the evening, Pancha was worried so he rushed to Balaju police station. He did not see Kamala's name there, but someone told him that those who were seriously injured were taken to Bir Hospital, so he went there too. At Bir Hospital he was told that a women whose description sounded like his wife, had been taken to the Teaching Hospital at Maharajganj. When Pancha saw his wife's body there, he fainted. Pancha and Kamala were married 40 years ago. Neighbours say that they were inseparable. "We were always together. If she went somewhere alone, I would miss her so much that I would call her," remembers Pancha. Kamala had to undergo many operations in the last few years because she suffered from kidney and gynaecological problems. "She survived four major operations, she was a fighter. Who thought she would have to die this way?" asks Pancha. The Shahis had recently moved to their Balaju house from Banasthali. She was a devout Buddhist who would visit Swoyambhu every morning. She was excitedly planning her grandson's feeding ceremony and the couple were planning to visit their children in Germany and the US in a few months\' time. "It is ironic that someone who believed in non-violence was a victim of such terrible violence," says Pancha. The families are asking that the victims be declared martyrs and necessary respects be paid. They are outraged by the government's response to the explosion. Anisha's father asks: "The explosions happened in three places. Why hasn't the government found those responsible and punished them?" Sadly, the families do not have very high hopes of the government. Pancha Shahi says the government needs to do more than just draw sketches of who they think may have been responsible. "If the victims had been children of ministers they would understand our pain. We don't expect much from the government, after all this is a state of impunity," says Sandhya's father, Narendra.